This beautiful and healthy starter will impress your guests and it is super easy to prepare. You really can’t go wrong making it. It is of course important that you buy a quality piece of tuna that is meant to be eaten raw – ask the fish market for ‘sushi grade’ tuna, which will be fresh and will have been frozen previously to kill parasites. 1. Cut the tuna into small cubes. Add the soy sauce, black sesame seeds, and scallions and chill in the refrigerator until ready to serve. 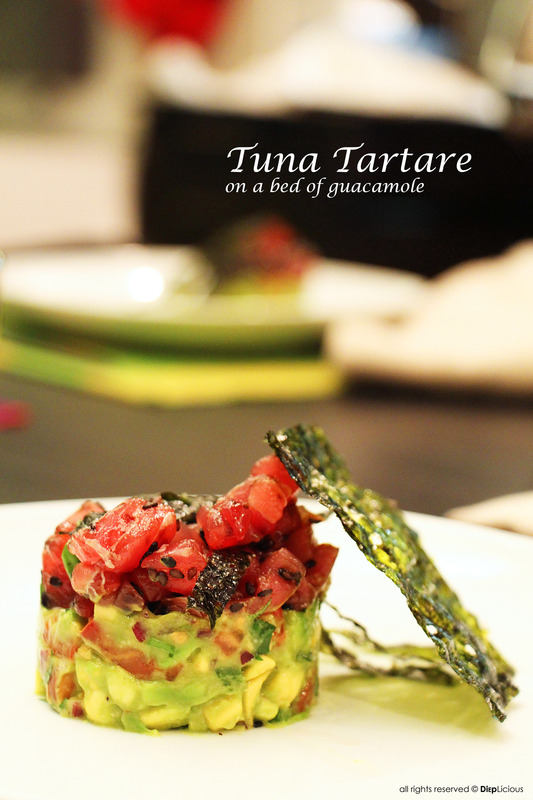 Place the 2 ½ -inch ring mold on a plate and fill about 2/3 of the height of the mold with guacamole, and the top 1/3 with the tuna tartare. 4. Remove the ring mold, sprinkle a few strips of seaweed on top, and lean one large piece of seaweed on the side for garnish. You can top it with a cilantro leaf for an additional aesthetic effect. Thanks Nora, I can highly recommend to make this. Your friends will love it.